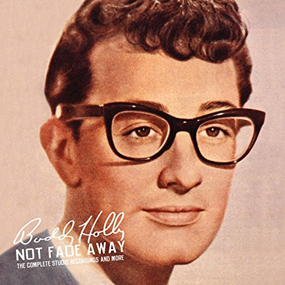 He died at 23 after just three albums yet Buddy Holly’s legacy is formidable – after all, this is the man who saved rock. Why? Because in the late fifties rock ‘n’ roll was still a novelty. Still derided by snobbish, cool-brigade jazz critics. Still perceived as a passing phase by the moms and dads of America. And, worse, ripe for pandering to those that were ready to milk it for every lowest common denominator dollar they could before it died its inevitable slow, undignified death. How did he save it? By rushing every door that the detractors tried to close. When they said dumb, Holly outsmarted them. Where they cried uninspired, he outwitted them. When they called it dour – well, listen to the evidence. ‘Oh Boy’, ‘It Doesn’t Matter Anymore’, ‘Not Fade Away’ and, best of all, ‘Rave On’. My, how that little ditty would rock like a mutha in the 21st century. Needless to say there were a few keen listeners – Lennon, Dylan, Jagger to name a few. These 203 tracks in Not Fade Away basically compile everything he ever put on tape. It includes numerous outtakes, alternate mixes, instrumentals and even fragments of conversation. It’s a completist’s fantasy. If, however, it’s the 30 or so adrenaline-firing blasts of life-affirming, prototype rock ‘n’ roll you’re after – go buy the nearest greatest hits for a couple of quid. But this package is more than that. It’s a warm legacy to a man who never got the career and the plaudits that he so richly deserved.